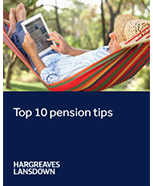 This simple, no-nonsense guide suggests 10 ways to improve a pension. Download or request the guide by post now. This guide is not personalised advice. Top 10 tips to improving a pension - simply confirm the last three characters of your postcode below. This guide is not personal advice. If you are unsure of an investment's suitability, you should seek expert advice. Tax rules can change and any benefits will depend on your circumstances. All investments can fall as well as rise in value so you could get back less than you invest. Once held in a pension, money is not usually accessible until age 55 (57 from 2028). How to benefit from the pension freedoms and avoid common retirement mistakes. How to review a pension and use online tools to calculate the income a pension might generate. LISA or pension - which is better? How to monitor pension investments and effectively manage investment risk. Tax advantages of investing in a spouse's name.